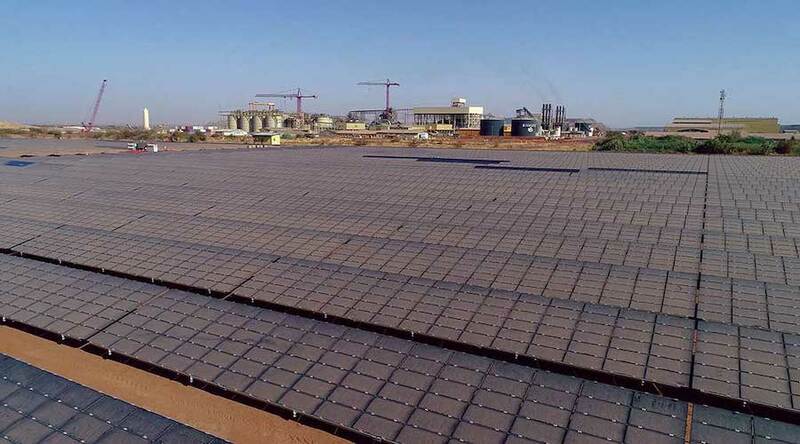 Solar panels in front of processing facilities at IAMGOLD’s Essakane gold mine in Burkina Faso. Photo by IAMGOLD. According to the market research firm, off-grid mines could benefit from reducing their dependency on diesel while taking advantage of the favourable climate conditions in the area. “In SSA, the remote location of many important mineral deposits in combination with the underdeveloped state of power and transport infrastructure means that there are a large number of mines that are not connected to national or regional electrical grids. As a result, many of these mining operations are highly dependent on diesel-generated power, which is expensive to transport and subject to significant volatility in terms of pricing,” the report reads. Fitch’s own forecast predicts global diesel prices to average $96.2/bbl by 2022, up from $89.6/bbl this year. In the analyst's view, miners’ dependency on the fossil fuel would be significantly reduced if they adopted renewable power, something that a few companies such as Newmont, IAMGOLD, and B2Gold, who are operating in remote locations in Sub-Saharan Africa and have invested in solar power, are already experiencing. “In all cases these projects are hybrid in nature, meaning they combine solar and/or wind power, and in many instances energy storage, with diesel or HFO (heavy fuel oil) through microgrids that are not connected to the state-grid. Decentralised power generation in the form of hybrid microgrids has advantages beyond price, allowing miners not only to reduce their exposure to expensive fossil fuels but also make use of them as back-up power when solar or wind power is unavailable,” the report states. Fitch’s experts also suggest that grid-connected mines would also benefit from incorporating renewables to their power mix, as they can play a role as potential remedies to the challenges associated with the unreliability of conventional grid power across the region, where power outages and exorbitant electricity prices are commonplace. “Key mining countries that are highly dependent on hydropower, such as Zambia, the DRC or Namibia are prime examples of markets where grid-connected mines can benefit from adopting renewables. In Zambia for example, severe drought over 2016/17 highlighted the risks associated with the country's over-dependence on hydro-power, as it resulted in a tariff dispute between the government and the country’s major copper miners,” the market researcher exemplifies. Poor corporate governance and financial management of the domestic power sectors in countries where miners operate are also highlighted as major risks that should lead companies to avoid relying on their grids. 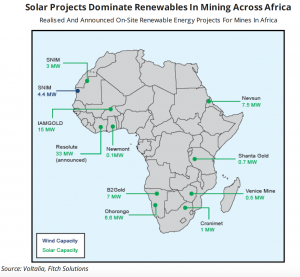 From a more positive point of view, Fitch says that favourable climate conditions in Sub-Saharan Africa should push more miners towards renewables. “Africa receives more hours of sunshine during the course of a year than any other continent on earth, meaning solar will remain the renewable power of choice for miners looking to reduce their exposure to fossil fuels,” the firm's analysis explains.